Mahmoud Bey, fallen out of love with his first wife, Waheeba, brought in to his traditional Sudanese household a beautiful Egyptian woman as his second wife. Filing for divorce would have been best before marrying for the second time, however, he decided not to. Perhaps, it was because of the two sons he has with her (Waheeba)? Nassir and Nur. Though, Nassir was hopeless and Nur who was assumed would take up the family business ended up helpless. Mahomoud Bey's brother, Idris with whom he lives and runs the family business, is widowed with three daughters. His first daughter was barely mentioned, the second daughter, Fatima, married her (hopeless) cousin Nassir, while Soraya was informally betrothed to his cousin Nur, everyone's favourite until calamity befell him. As you can see "Lyrics Alley" narrates the story of a wealthy Sudanese family striving against all odds to live up to their reputation. Keeping up with old tradition and culture that shows little or no regard for women. Even though, their younger generation were singing a different tune. I discovered Leila Aboulela through her short stories, she has a somewhat intimate way of narrating. I went ahead and read Minaret and really enjoyed it. I cannot say the same for Lyrics Alley. It is not a family saga, not even close to it, it is simply a very well written love story that unfolded in a family setting. Do not be deceived with the family tree at the beginning of the novel (which helped). Nonetheless, there is no dramatic metamorphosis, it is more or less a 300 pages novel. I recommend. Glad you got to read this one! I read Minaret just after Lyrics Alley, but while I enjoyed it, I preferred Lyrics Alley. It sounds like you feel the other way around! Maybe it's just whichever one you read first! Yeah, I totally felt the other way round, Lyric Alley was somewhat all over the place (in my opinion), Maybe it's me though.. I read it before and after my wedding, I believe I had my head somewhere else. I read Minaret during my holidays in Menorca, it was calm and quiet on the beach so I was able to connect with the character. Maybe it was that or I have grown a little bit more demanding in my book reading because I read a lot or maybe it is what you say. 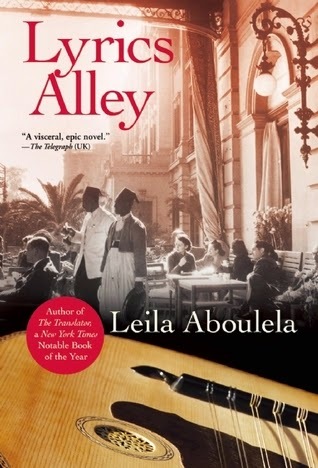 All the same, Leila Aboulela writes very well, I will read more of her works. I think with Minaret I just got impatient with the main character. I wanted her to make more of a change in her life. (At the same time I know it is realistic that not all characters are take-charge sort of people.) But I agree that Leila Aboulela writes very well and I will definitely read more of her books! I see what you mean... I think what I like about Minaret was first of all it was written in the first person narrative. The writer gives me a free pass to get into their head and mind to feel what they feel as if, let's say it was happening to me. Also, I kind of understand that surge of something, hope, nostalgic feeling that weighs on her. Finally, the feeling of acceptance and finding solace in religion. I think it was a realistic story that explore emotions. Yes, let's read more of her books. Great review, Mary. Yet to read any of Leila Aboulela's books. Hi Celestine, you should get to read her writings, she writes really well. Just discovered this blog and loving it! Monique Thank you very much. I appreciate.